Wilkinson Eyre Architects’ Part One students have completed their ‘Anything But Grey’ installation in Benjamin Street Gardens, Clerkenwell. The installation has been conceived, designed and – in part – constructed by the team of seven students as part of the London Festival of Architecture with the support of Islington Greenspace. The installation has been built around an existing park-keepers hut, and is intended to be the start of a more permanent arts legacy for this small but precious green space. ‘Anything but Grey’, true to its name, comprises a folded bright pink cladding, which wraps around the hut, leaving its brick structure untouched. Inside mirrored light shafts and a central kaleidoscope reflect images of the park and passers-by into the installation, while spyholes reveal surprising urban views. The team of students has also designed floor and wall coverings that bring views of the outside inside the space. Benjamin Street Gardens – formerly an overflow burial ground for St John’s Church – is vital to the intimate character of Clerkenwell, providing a welcome relief from the tightly knit network of streets and lanes north-east of Farringdon Station. Integral to the design of ‘Anything but Grey’ are ideas for a more permanent legacy for the park, in support of Islington’s plans for the longer-term regeneration of the space. The installation is open to the public 9.30am – 6.30pm Monday to Friday from 20 June – 20 July 2008. The Anything but Grey team is Sarah Borowiecka, James Christian, Deborah Dix, Rocky Marchant, Ciara Reynolds, Jonathan Shaw and Simon Watson (with support from Keith Brownlie and Emma Keyte). As well as the ‘Anything but Grey’ installation, Wilkinson Eyre are participating in a number of events as part of London Festival of Architecture, including an architectural tour of Kew Gardens on 8 July and an exhibition on sustainable office design at the Royal Exchange. London Festival of Architecture will be one of the world’s major†celebrations of architecture and the built environment.† London’s landscape will be transformed during the spectacular month-long†festival, which will include over 500 events for visitors as well as architecture professionals. Organised in association with Design for London, events including exhibitions, architect-designed pavilions, film-screenings will take place at national cultural institutions like the British Museum and the Victoria and Albert Museum, high profile outdoor public spaces, and places of architectural interest across the capital. In association with the British Council, LFA2008 will also include an international Embassies Project to link this celebration of London’s architectural activity with that from over twenty countries around the world, and a National Architecture Student Festival where temporary structures will spring up across the city, offering shelter and demonstrating how unused spaces can be transformed. Kensington, Chelsea & Knightsbridge Hub – focusing on museums and galleries in South Kensington, and on the proposed ‘shared space’ public realm scheme in Exhibition Road by Dixon Jones. Canary Wharf, Stratford & Greenwich Peninsula Hub – debates on the future of East London in light of planned major development, a major lecture by a world renowned architect, and open air events exploring the area’s docklands and rivers. King’s Cross, Bloomsbury, Fitzrovia & Covent Garden Hub – exploring the new masterplan for Bloomsbury, a network of public spaces between the British Museum and the new St Pancras International terminal and talks at New London Architecture. South Bank & Southwark Hub – including evening events on the Riverside Walk and exhibitions and talks in cultural venues including the Design Museum, and a new temporary structure by French architectural collective EXYZT. 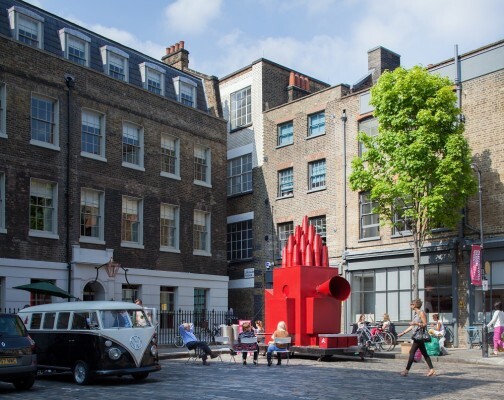 Clerkenwell & City of London Hub – including events exploring high-tech sustainable architecture and the future of work places, installations in Paternoster Square, Smithfield Market, Clerkenwell Green, and a ‘medieval market’ on Cheapside, London’s first high street.